Not just Spanish Property falling, check the UK´s. Spanish Property Insight › Forums › Spanish Property Forums › Real Estate Topics, News & Discussion​ › Not just Spanish Property falling, check the UK´s. This topic contains 70 replies, has 17 voices, and was last updated by katy 11 years ago. ITV recently mentioned the website http://www.propertysnake.co.uk. 3 months ago it showed 71000 house price reductions in the UK, 2months ago 92000, but have just checked again and it now shows over 125000 reductions and this seems to be accelerating fast. Bearing in mind people often remorgage their UK homes to buy abroad and lending getting tight, plus the poor exchange rate from sterling to euros etc, it all bodes badly for not only Spanish property sales but also other Eurozone countries. Bank the money while you can and get 6% interest methinks! The figure on http://www.propertysnake.co.uk of house price reductions in the UK has risen to almost 150000 now, it is increasing by some 8000 per week. 3 Million UK homes are in danger of negative equity now, mortgage lending getting tighter and people are taking out other loans, overdrafts and cr. card borrowings just to keep going. A snowball effect appears to be happening in the UK, like Spain it seems, some analysts (not estate agents who are biased) are saying prices will fall maybe 20% or more now in the UK. The problems seem to be global. Angie, a year or so ago an Indian banker warned that property prices in Mumbai were getting to be ridiculous. In my wildest dreams I could never imagine spending the money they ask for property in Dubai or Shanghai. Angie’s post is interesting… I look at the site, mainly out of curiosity – they listed a house actually on my road actually on sale for something like £200k plus – wrong!! There was a house for sale but no longer….. I put a post on their site but it hasn’t been answered yet!! I guess the old adage “don’t believe all you read” is correct. All these sights are like “Tequila” has to be taken with salt. How right you are to say not to believe everything you read. I certainly do not believe everything I read, in fact some of it is probably worse as all the facts are not out yet. Don´t forget UK unemployment figures which look ok on paper are in fact massaged by back to work schemes/benefits that the Gov´t introduced to hide the true figure. However, we´ve also now been told by HBOS that UK property fell 2.5% last month, that 117,000 London Non Doms may sell up and leave the country, that 10,000 City workers will lose their jobs in the next 3 months etc, and the IMF predict at least a 10% fall in UK property prices, and Property Snake has risen to 158000 over the weekend too. Even Nigel Lawson says the UK economy is facing recession, he should know a thing or two. I would go as far as to say we have been in a world-wide recession for at least 12-18 months. The only doubtful thing is, how much further will it go and how long will it last. I think the past 10 years in the UK has shown a huge year on year increase in personal debt, that in itself is the best indicator of a recession, because at some point, people have to stop spending and start paying off. That brings about lower retail sales, job losses and a fall in property values. I agree with you Peter, generally what goes up does come down albeit in a cyclical way, and the UK now has very overpriced property too. I think a lot of people forget what happened in the early 90,s or say things are different now with interest rates and demand for property, but now instead of 12% int. rates with 3.5 times your earnings borrowed as then, many have borrowed 5-6 times their earnings although at lower rates. It´s a potential timebomb, with the increase in cost of living, personal debts etc. Much of the market has been underpinned this time by buy to let investors who could bail out if their investments fall. The Property Snake website is showing a huge rate of new price reductions weekly, it´s staggering really. There seems to be a certain “uncertainty” as to whether there are massive price reductions on properties here in Spain. Such as Katys post and others who have yet to come across real resale bargains. In my experience over the past few months, vendors seem to fall into 2 categories. 1) Those who bring me their properties for sale because the seem to hate living in Spain and want to get out as soon as possible. 2) Those who need to sell for financial reasons. There is a third category of vendors, people who want to sell to move on, maybe re-buy in Spain or some other country. However this 3rd category seem to be able to sit out the down-turn and are the easiest to persuade not to market their property at present as they are in no rush or, need to see a full asking price. The vendors in category 1 are where the bargains will lie. Last week I was marketing a property at €275,000. It has a 2 month old bank val of €310,000. They have accepted an offer of €215,000. This in itself is only a 30+% reduction in bank val and not the 50%-70% reduction that most people, especially ralita are expecting. Those vendors in category 2 are not so keen to drop by large amounts, mainly because they probably have a large mortgage to pay off, or need a certain amount to pay off their financial problems. I really don´t think we are going to see the 50% or more reductions that are anticipated. People just cannot afford to loose too much on their sale as they have to buy in more expensive markets, if returning to the UK. I think realistically, 35% reductions from bank valuations are going to be the majority of reduced property prices, though I admit there will be the odd 50%+ reduction, they will be very rare and certainly not the norm. I know we all discredit bank valuations, however this is what will set the bench mark for % of reductions. We have to have a measure, and as the market is all over the place with “market valuations”, mainly related to location and condition, it will have to be bank valuations from where we measure the discounts. Yes bank vals will come down over the next year or two, but under controlled condition so the banks do not repossess properties that their valuations have put into negative equity. To sumarise my feelings, I don´t expect the average bargain to really exceed 35% of bank val, except in exceptional circumstances. I have always believed in my time as an estate agent here in Spain that property prices have been around 35% over-priced. That just about accounts for the overseas demand which has previously existed here and is certainly the difference between what a Spaniard would pay for a property compared to a UK buyer. I suppose, at the end of September after the buying season has not materialised, we shall see the true state of market and bank valuations. Does anyone know how long the last property recession lasted in the UK? I remember buying a property in London (probably 1989, not sure) and within a short time the value dropped about 25%. Equally it only seemed a couple of years and it was worth 25% more than I paid. Short on detail I know but was a bit busy then and working abroad. Are you referring to the commercial or domestic market, as the commercial did tend to improve some 12 months or so before residential. I think your timescale is about right Katy. In 1988 I bought a 3 bed detached for 35,000GBP. I sold it after a few minor renovations for 88,000 in early 1990. It was bought by my lawyer. He sold it on in early 1991 at a small loss. But by 1994 it was resold for 120,000. However the credit crunch back then was not so world wide and was more to do with the run on the pound, there was no Eurozone to contend with either at that time nor was the US economy in such a mess as it is now. The banks were also less vulnerable then. I think we are in unknown territory with this one and no historical model can provide the answers. We had Mr Soros to thank for the run on the pound? So if people hadn’t been given the opportunity to buy their Council houses at knock down prices, they may not have been tempted to borrow? Then, that would have followed on by not every 20 year old thinking they must buy at whatever the prices and if they can afford it. It does seem quite strange when 20 years ago, everyone thought it fantastic they could buy as opposed to rent. Now, it is a case of buy, then borrow on it to buy in the sun. What next, will everyone expect to own their own Island? Forget what the historical data says about the last crash (1988 to circa 1994) vis a vis prices only falling circa 17% on average across the uk. At the time I managed several Connells Branches in the South of England and this is what happened. In Aug 1988 people stopped buying, demand just dropped off a cliff, just like Florida in late 2005, Spanish Costas 2005/6? and Ireland/UK 2007. With volume thin and with lagging indicators prices started to fall (in West /East Mids, East Anglia, London/South East and the South West, in 1989. At the same time prices were still rising in the North East/West and Scotland and continued to do so albeit at a slower rate for 2 years. This had the effect of reducing the UK average fall (shown in the stats) to circa 17% eg. London down 30%, Manchester, Glasgow, Leeds and Newcastle down 6% etc = what crash? This only happened because the prices in the North had not risen like the ones in the south. This time with prices in the North having ‘joined the party’ of unsustainably high HPI over and above what the fundimentals will support and because a large percentage of the last 5 to 6years increases was based on demand fueld by loose lending criteria and artificially cheap debt/mortgage rates, no such statistical cusion will exist. Last time in all the English regions I mention the peak was Aug/Sept 1988 the bottom was circa 1992/3 and for a two year period you there were hundreds and hundreds of thousands of properties available at between 30 to 55% below the peak of the boom prices and no one was rushing to buy them. I appreciate it is difficult for younger people (and those not directly involved to really grasp what happened). It proably took the average property circa 7 to 10 years to regain its value from the bottom. Back then BTL was a minisule proprtion of the market now it has grown massively and personal debt (other than mortgages was virtualy none existant). It will be interesting to see how the sentiment/psychology or this generation holds up as the bad news increases (which it will) and they start to shuffle and then bolt for the exit! It looks like were going to see more!!! I’ve felt for ages that BTL investors will start dumping their props. to take advantage of 18% cap. gains. Many won,t cover their mortgages with rents, and prices falling instead of rising will make many hand their keys back. Much of the property market has been underpinned by BTL which wasn’t the case in the last crash. The point regarding the increase in interest “a popular deal two years ago was a 5.25pc two-year fixed rate. Borrowers are now facing rates of at least 6.5pc.” Would suggest there is likely to be an increase in rents for tennants. At the end of the day, the UK is bankrupt. That is why the pound is now worth so little! The UK house prices will fall at a higher rate than those on (legal) Spanish houses. GOOD! The UK and it’s people are so property price orientated. They are the ones that have caused the problems in Spain, thinking they will make a quick buck at the expense of the Spanish. If you wish to buy a property, then buy for the lifestyle – not to make money. Let’s get real, for years people in the UK have lived on credit and now it is wake up time for so many UK residents/expats. If they needed to borrow (heavily) to buy anything including Spanish property they, on the whiole were buying a dream they could not afford. Just remember that within the EEC, the UK is the single worst country to live in, offers the worst publice services and has fuelled hiper inflation throughout Spain but at the costs that go with borrowing money. Oh for goodness sake, your argument is weakened not strengthened by silly exageration. The UK economy, like many others, is heading for a recession. This happens every 10 years or so and is quite unavoidable. The pound is actually worth quite a lot in $US. It happens to be weak against the euro because our bank is lowering interest rates while the ECB is maintaining rates. UK, bankrupt! get a life. Zimbabwe – that’s bankrupt. UK’s a bowl of flippin’ cherries. You are showing your ignorance Rob. 😆 That’s why we have soooooooooooooooooo many immigrants coming to the UK claiming benefits as soon as their feet touch land! Get real!!! and has fuelled hiper inflation throughout Spain but at the costs that go with borrowing money. You are obviously worried that the UK gravy train is drying up. Would suggest there is likely to be an increase in rents for tennants. Worst country? Worst public services? Do you know what you talk about? Careful Ralita, don’t question……. the King of Insight has spoken. and spain, france and germany have a higher % of immigrants than the UK. Errr, compare the size of the UK to France ,Germany, Spain!!!!! % wise we have a very high number of foreigners/immigrants claiming our state benefits. France Germany & Spain do not have free health care across the board to foreigners. If the UK is so bad, why do these immigrants come in droves? They come in droves because we are regarded as a “soft touch” country and our benefit systems are easy to manipulate. (My experiences whilst working as a Fraud Investigator for a number of Government Agencies – lead me to that conclusion). Errr, compare the size of the UK to France ,Germany, Spain!!!!! % wise we have a very high number of foreigners/immigrants claiming our state benefits. France Germany & Spain do not have free health care across the board to foreigners. well you just answered you own question. Fuengi, you only compared France Germany & Spain. I’m not getting into an argument. Pointless on this emotive subject. I agree with Oliver. i used those countries only has examples of countries with a higher % of immigrants than the UK. A majority of mainland european countries have higher figures than the UK. UK get alot also for hte language reason. Same reason why france gets alot of north africans and spain alot of south americans. Also fun fact, keeping to %, the bearly tops the tables as an emigrating nation. I suspect the UK plays down its immigrant figures. Many other European immigrants eventually find their way to the UK. Not suprising, there is no safety net as in the UK. I read on another forum last week that a Brit working here in Spain had not been paid for 5 weeks and said they were behind with the mortgage and didn’t even have the money to buy a cup of coffee. At least in the UK you can throw yourself into the benefit system. 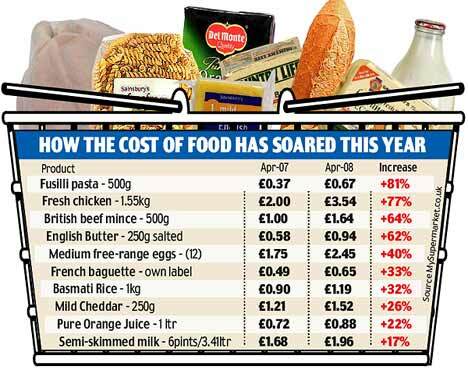 Inflation in the UK was 2.5% here in Spain 4.5%! Unfortunately for food, inflation has far surpassed 2.5%. I´ve noticed that George Soros is appearing more and more on TV talking about credit crunch etc, without sounding too pessimistic could he or a few others be waiting for the time to either start another run on Sterling or even the Euro sometime, it wouldn´t surprise me at all. Too many big players can manipulate currency markets. Uk housing stats do seem to be very negative now also, maybe we´re just following the US a year later although probably not as severe. According to ITV prog last night about housing following up on their prog. a year ago, Phil Spencer had got it completely wrong then saying prices would rise 10% when they´ve fallen 10% and more in some areas, but then he´s an Estate Agent so bound to talk things up. It looks like the market is heading South for a few years both in the UK and in much of Europe, the exchange rates are playing havoc with peoples finances for stage payments abroad. the King of Insight has spoken. This is the kind of comment that devalues this forum so much, the sarcasm and rudeness of certain self centred members so full of their own importance! It is funny that the same two or three people who have no worthwhile opinions turn to this childish behaviour when they are unable to string together a sentence that adds to a debate in a positive manner. Think we will also find that these two or three people are also the ones that act as permanent spokesmen for the “anti Spain” brigade. I get the impression that maybe they are actually estate agents promoting the likes of Morocco, Bulgaria etc as they seem able to provide little positive input to a forum about Spanish property matters!!!! As time passes your messages become more and more illogical. What is your contribution to this forum except saying that UK is the worst country in EEC? Do you have many friends/relatives who share this opinion? If yes, you should all get therapy as soon as possible. Rob, Charlie is not anti Spain as you say, just like many of us pointing out the pitfalls re property deals in Spain because many have had their fingers burnt. Spain is a beautiful country away from these ghastly Costas, with their overbuilt concrete prison block estates and ruined landscape. Is their a more corrupt property industry anywhere based that compares with the size of Spain´s, even the UK´s latest bombshell can´t compare?